Trembling Bells with Mike Heron and Evil Blizzard's alter-egos Clones also feature at Preston's new psych/folk weekender. 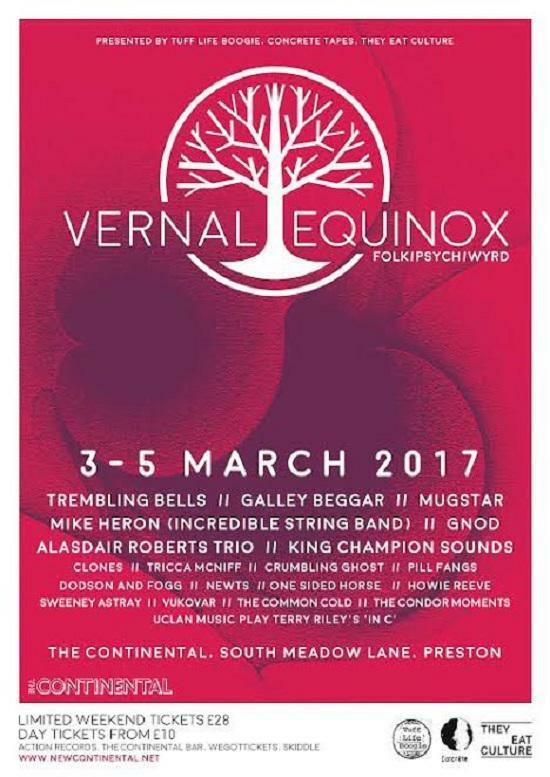 Trembling Bells, Mugstar, and Galley Beggar will headline a new addition to the festival circuit next month at Preston's Vernal Equinox. The Weekender takes place March 3-5 at real ale pub/restaurant and arts hub The Continental. Mugstar headline on Friday, while tQ favourites Gnod also top a bill curated by the city's own Concrète Tapes label that day, which also boasts the debut performance by Preston natives Evil Blizzard under alter-ego Clones. Also on Friday are King Champion Sounds, who will perform a soundtrack to the film Man With Camera, Pill Fangs and The Condor Moments. Folk-rock outfit Galley Beggar headline on Saturday with support from Crumbling Ghost and Newts, while Trembling Bells will perform two sets on Sunday. One will focus on their own material, while the other pays tribute to The Incredible String Band, with a guest appearance from the folk legends' Mike Heron.